One of the many challenges facing the beginner is one which I call “systems overload.” You listen to a guitarist – any guitarist, it doesn’t matter if it’s Jimmy Page or Jimmy the kid who lives two blocks away and has only been playing for a year and a half – and all you can think is, “There’s no way I’m ever going to play that good! What am I going to do?” For some reason, while we are able to be in awe of anyone else who so much as touches a guitar (and often at the drop of a hat), we often fail to appreciate what we ourselves have learned. Most of the time, we do not realize what we have learned! Sometimes it’s a good idea to think about what we already know and to play around with that knowledge to see where else it can take us. Many people who have been playing guitar for a while simply do not realize that they already have a lot of important information available to them. They are obsessed with finding the “next step,” the one that will magically allow them to sound just like the pros. And being fixated on some mystical unseen point, they just do not take the time (and effort) to understand that many of the “next steps” are literally at their fingertips right now. It’s the old “you don’t have to go any further than your own back yard” thing again. Let’s look at an example of what I’m talking about. Here is Bob Dylan’s If Not For You. In and of itself, it is a very easy song. You won’t find any tricky chords and if you already know the song you’ll be able to breeze through this on the first take and then wonder why I’d make a lesson of it at all. These files are the author’s own work and represents his interpretation of this song. They are intended solely for private study, scholarship or research. This is yet another moderately paced song in 4 / 4 time. And, for those of you with metronomes at home, when I say, “moderately paced,” I mean about 110 beats per minute. To me, and please understand this is in no way scientific, 80 to 100 is slow, 100 to 120 is moderate and anything over 120 is fast. Yes, there actually are tempo settings complete with fancy names and if you’d like, one day I’ll expound upon that. But for now, let’s just say 110 and get on with the lesson. If you’ve never heard this song before, part of its hook is the distinctive rhythmic pattern that is punctuated by the chord progression used in the first three lines of any given verse. Okay, now on to the fun stuff. When I am certain that my student knows this song, I will then give her or him a slide and say, “okay, now you’re going to play this song using this instead of your fingers to make the chords.” If you’ve never seen a slide before, it is a hollow cylinder, usually made of metal or glass. You put this on a finger (and we’ll argue about which one later) of the hand you use to fret the guitar and slide it along the neck in order to produce notes. So where on the neck do you put the slide? Well, this may seem a bit of a puzzle, but please believe me, you have the knowledge you need to figure this out. It’s simply that you may not have thought things out in this manner before. “If Not For You” is the opening track on Bob Dylan’s 1970 album New Morning. 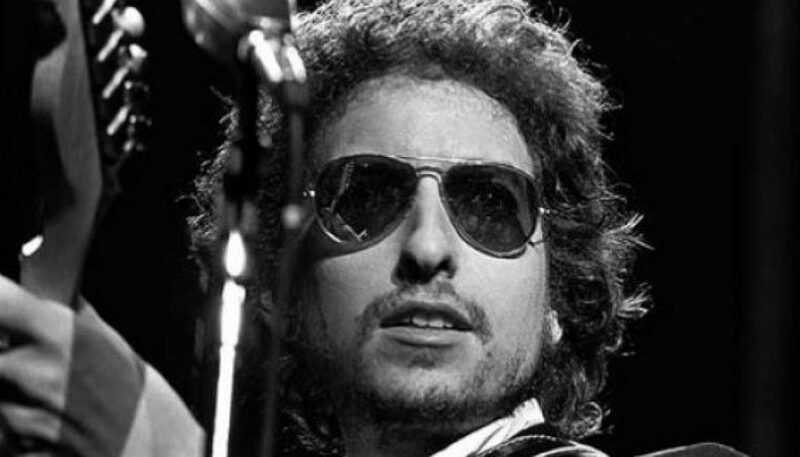 Dylan first performed the song live with George Harrison at the Concert for Bangladesh in New York in 1971. Harrison covered the song on his solo album All Things Must Pass in 1970 with the help of Ringo Starr and Billy Preston. A couple of tips and some words in general: Even though the theory behind using a slide is simple, actually playing with one takes some time and practice. Since it sits above the strings and the fretboard, it’s almost a good idea to think of yourself as not even having any frets. The slide negates the frets and will be sharper or flatter than you might think depending upon where you place it. This is why it takes practice. When you “fret” a note or notes with the slide, you want to be almost on top of the fret instead of behind the fret, as you would be with just your fingers. Be sure to hold the slide so that it is parallel to the frets. That’s perpendicular to the neck. If you fret at an angle, then your notes will be sharper or flatter in accordance to the slant of your slide. I play with the slide on my ring finger. This way I can use my index and middle fingers to lightly press the strings behind the slide and damped any “excess” noise. If you’re so inclined, a lot of people place their guitars on their laps (face up, naturally) and use the slide on the index finger. This is actually a good way to see exactly what you’re doing! What about playing a chord? Well, let’s think this out. Any basic chord, as we’ve learned from reading our columns on theory, is three notes, usually the root, third and fifth. This is certainly true of major and minor chords and that is what we’re concerning ourselves with today. In order for us to play a either a major or a minor chord with the slide, we need those notes to be on the same fret so that the slide can play them all at once. Do you see the logic in this? Good. So now let’s think about the chords we know. Do any of the many chords that you’ve learned so far have three notes on the same fret? So now we can play the almost all of the verses of If Not For You with the slide. And all of the bridge as well. What about that Am? Once again, let’s think this through and, this time, remember what I told you about the G major chord. Are there any minor chords that you know how to play where the three notes of the chord are on the same fret? I did this in two ways because the seventh fret of the D string is the A note and since we also could use the open A string, I figured, “why not?” You get a slightly different sound depending on the voicing you decide to use. I like them both. Anyway, back to our song (which is probably miffed at being left behind while we’ve been learning all these fun things). I always think it’s a good idea for beginners to use a slide in order to help learn about where notes and chords are on neck. But I also think that it is easier for a beginner to play with a slide while someone plays the “regular” chords without a slide. This way it doesn’t sound so, shall we say? weird. When you’re used to full chords using all or almost all the strings, you might wonder if you’re playing it right when you’re only using three strings at a time. So either teach one of your friends this song or make a recording of it on a cassette and then play along with yourself on the slide. One last note: You really can’t do this on a classical, or nylon string, guitar. There just isn’t any resonance. But if you have an old guitar with high action that you don’t play anymore, a slide is great for that. So if you ever thought about getting rid of a guitar because it’s turned into a cheese slicer, you might want to consider keeping it around just to practice your slide work on. We’ll be doing some more slide lessons next year (time is flying, no?) but if you’re interested, one of the pieces I wrote last summer includes slide work. It’s called Applied Science and it essentially teaches you how to play the intro leads and slide solo for the Pink Floyd song Wish You Were Here using one guitar (instead of the guitar and dobro that is used on the recording). It’s a fun lesson and a great song. And while I hope you had fun with this, I also hope that you remember that figuring out the basics of using a slide wasn’t all that hard at all. We already knew the things that we needed to know concerning how to find the major and minor chords. It was simply a matter of realizing what we knew and then applying that knowledge to the task. David, thanks again for a great lesson. I am amazed how easy you explain things I need to get going with songs. I am a strong beginner (maybe low end intermediate) player. I do miss the examples that used to be provided with the lessons – censorship. In any case, are they posted anywhere else (the forums)? Thanks for writing and thank you as well for your kind words concerning my work here at Guitar Noise. For whatever it’s worth, the missing examples aren’t about censorship and never have been. They are about paying to the songwriters what is rightfully due to them. That’s why we’re still working on negotiating with the various publishers in order to purchase the legal rights to use their copyrighted material. Hopefully, this will be one that we’ll be able to get in the not to far-off future.